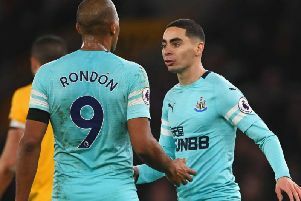 Newcastle United are set to face a Cardiff City side with extra firepower in Saturday's Premier League relegation six-pointer at St James's Park. Just one-point separates the two teams in the top-flight table, with Rafa Benitez's men in the relegation places and with the second worst home record in the division. The Magpies, off the back of a gruelling FA Cup encounter against Blackburn on Tuesday night, rested key players for the Cardiff showdown, however are experiencing a defensive crisis. A Newcastle defence, who is likely to be without Ciaran Clark, Jamaal Lascelles and Paul Dummett, could come up against a new Cardiff striker, subject to international clearance and Premier League approval. Oumar Niasse, previously linked with a switch to the Magpies and Huddersfield Town this month, has today signed with the Welsh club on loan until the end of the season. And Cardiff manager Neil Warnock has hinted he is tempted to throw the Senegalese forward straight into the mix in what could prove to be a season-defining result for both clubs. "I’m relieved," said Warnock after securing the 28-year-old's services. "I thought it was done yesterday so to find out this morning has been a little bit unrestful but it’s nice to know he’s available for selection! “You’ve got to understand it’s not the be all and end all for Everton that we have Niasse. I don’t mind as long as I know. “Jagielka said he’d be my type of player. There’s not many players on loan who are like Niasse. I wanted Clyne but that meant I wouldn’t have been able to get Niasse. He’s got a chance to put himself in the shop window." Meanwhile, Cardiff are on the brink on announcing the arrival of a second striker with Emiliano Sala joining in a club-record £18million deal. Premier League rules stat a new player can feature for a club - if they are registered before 12pm the day prior to matchday. However, Warnock has already confirmed Sala will not be risked.